The Minority Justice Committee (MJC) was created in 2003 as a joint committee of the Nebraska Supreme Court and the Nebraska State Bar Association (NSBA) to develop and coordinate community outreach initiatives designed to broaden access to and improve public understanding of the legal system through partnerships with the NSBA, law schools, state and county governments, and community groups. Over the past decade, the MJC successfully focused on three primary objectives: to address racial disparities in the juvenile and adult criminal justice systems; to ensure equal access to justice; and to increase the diversity of Nebraska’s legal profession and judicial workforces. Historically, the NSBA funded the MJC with additional support from the Nebraska Lawyers Foundation, revenue generated from MJC-sponsored CLE events, and grant support for specific projects. Due to cuts in the NSBA’s budget, the MJC has been inactive since September 2014. The Access to Justice Planning Committee, recognizing the past important work of the Committee, recommended the establishment of a new Committee on Ethnic, Racial, and Gender Fairness in its final report to the Nebraska Supreme Court. The Access to Justice Commission co-chairs presented a plan for the creation of a Standing Committee to the Commission, with the name Committee on Equity and Fairness (CEF), along with a proposed inaugural committee membership to the Supreme Court in October 2017. The Court approved the Committee and its membership the same month. The Committee, chaired by Judge Stefanie Martinez, continues working on efforts to ensure racial, ethnic, and gender fairness in matters related to accessing the courts. The Commission began the process of re-instituting the collection and study of Confidential Juror Information regarding race, ethnicity, gender, and age. This confidential information was added to the Juror Qualification forms in 2005-2006 as part of a joint effort between the NSBA and the Judicial Branch to study minority participation in jury pools, but no organization has been collecting or reviewing the information since 2010. The Committee on Equity and Fairness will be overseeing this project, with the goal of identifying the need for specific initiatives to increase juror engagement among all demographics. 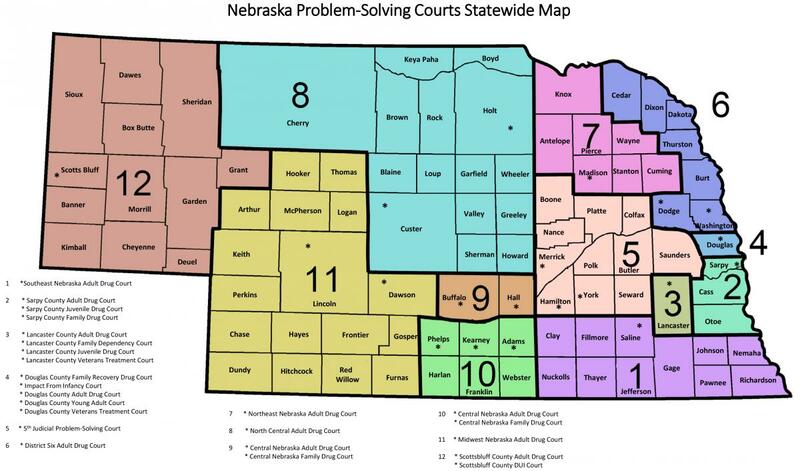 In addition, the CEF is looking at ways to reduce the failure to appear rate by utilizing the Nebraska Judicial Branch’s new capacity to automate messages by sending court date reminders. The Committee is also interested in the work being done to reform fees, fines, and bail practices.